There is no question that Tiger Woods is playing great golf right now, and is capable of winning on the biggest stages. That was exhibited this past weekend at TPC Blue Monster where he won the WGC Cadillac Championship. It was the seventh time he has won this tournament, and the 17th World Golf Championships victory in his career. Woods will have the chance to get back to the No.1 ranking in the world with a win at the Arnold Palmer Invitational in two weeks, in which he will be the defending champion at a venue he has also won at seven times total. 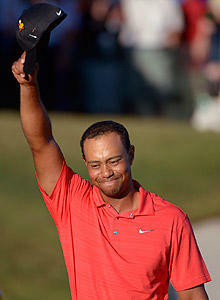 Let’s even say that Woods goes on to win at Bay Hill, and get the third victory of the season before the Masters. He should still not be declared ‘back’. And this isn’t being an overly harsh critic of him. This is an assessment by which Woods himself would probably agree. For so long, Woods judged himself only by his performance in Major championships, so then why shouldn’t that be the standard that we all hold him too? He has come close over the course of the last couple of years, but has struggled at times during the weekend, something that you know has to have been eating at him during this drought in the Majors. If Woods doesn’t win at Augusta in a few weeks, it will be five years that he has gone without a Major win by the time the 2013 U.S Open rolls around. Of course, if Woods goes on to win the Masters in April, all bets are off and we can finally say that the journey back to the top of the world has been completed, even if he doesn’t win another Major championship the rest of his career. It’s because that would be what the long journey back would have been for. To get back into the Major championship winner’s circle. Of course, a 15th Major would then lead to talk about a 16th, and so on down the line until he gets the opportunity to win 19 Major championships to try and break the all-time record of Jack Nicklaus. Woods will be the big favorite at the Masters, a place that he knows as well as any golf course in the world, and is very comfortable. The win at Doral will certainly place added emphasis on the outside expectations of the world for Woods when he tees it up at the first Major of the season. Make no mistake, it will be very exciting. This entry was posted in Opinion and tagged 2013 masters, 2013 us open, tiger woods, wgc cadillac championship on March 11, 2013 by Bryan.